Missing children should not be associated with your #WCW. If you are familiar with Internet lingo, you know that #WCW stands for “Woman Crush Wednesday.” On Wednesday, people share pictures of women they have a crush on. 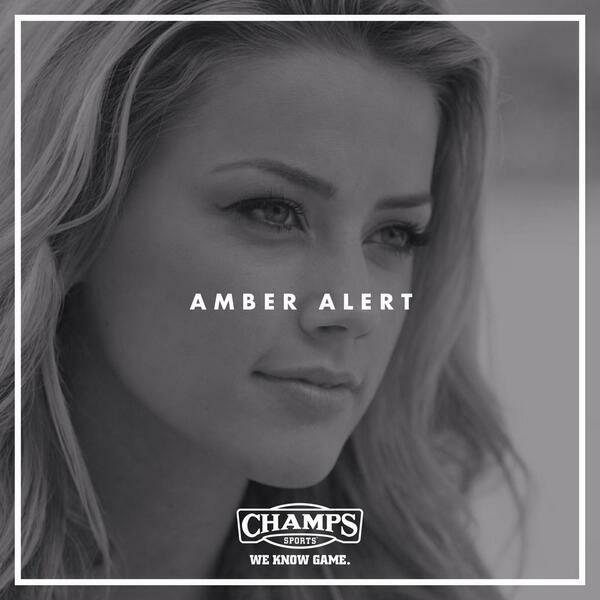 Champs Sports did that, but sadly decided to use the term “Amber Alert” to describe Amber Heard. People who follow Champs Sports on Twitter shot back at the poor choice of words, including me. @champssports Amber Alert probably not the best choice!! Rethink!! @champssports The many family members of missing children surely won't enjoy the Marketing Technique!! Be more sensitive!! @champssports Are you kidding???? Fire the the marketing person who had this idea and everyone up the chain and ok'd it! @champssports Wow how thoughtless and just dumb. Must have monkeys on the marketing team over at CHIMPS. This entry was posted in Advertising and tagged Amber Alert, Amber Heard, Champs Sports, Stupid people. Bookmark the permalink.